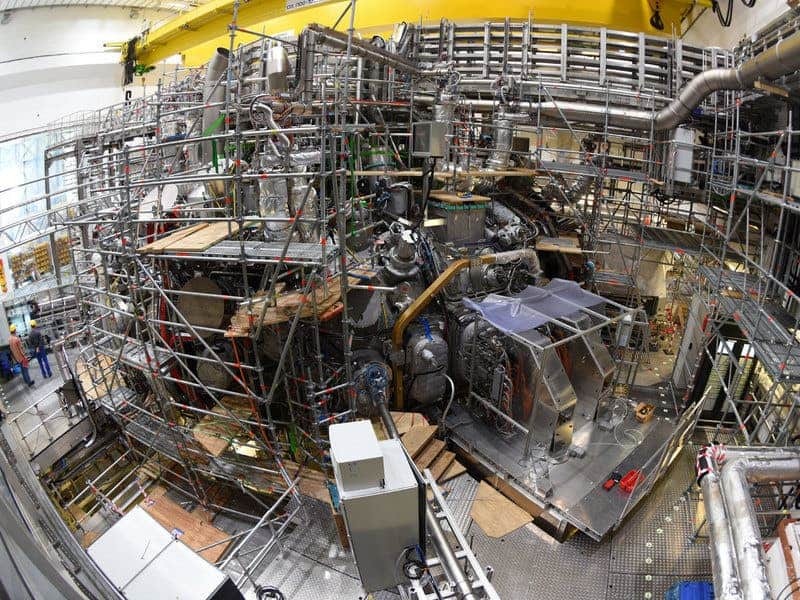 Germany’s extremely complex fusion machine, the largest of its kind, is reportedly working. This machine, called W7-X, cost approximately $1.1 billion, has a diameter of 52 feet (16 meters) and took 19 years to construct; the GIF above shows the layers of the machine. A stellarator is a device used to confine a hot plasma with magnetic fields in order to sustain a controlled nuclear fusion reaction. The key to fusion is to create ungodly high temperatures up to 180 million degrees Fahrenheit (100 million Celsius) and generate, confine, and control a blob of gas called plasma. At these incredibly high temperatures, the very structure of the atom changes, and the electrons are ripped from the outer shells, leaving positive ions. Normally, these ions would just bounce off each other, but under these conditions, they can merge together, creating new atoms, and – BAM – you have nuclear fusion. The basic idea to a stellerator is that the differing magnetic fields will cancel out the net forces on a particle as it travels around the confinement area. They were quite popular in the 50s and 60s, but their popularity greatly decreased in following decades, as other types of fusion research were carried. But stellerators have come back into focus in recent years, and there is a growing feeling that they could be the key to producing clean fusion energy. Fusion power would provide more energy for a given weight of fuel than any fuel-consuming energy source currently in use, and the fuel itself (primarily deuterium) exists abundantly in the Earth’s ocean. It also emits no greenhouse gasses and has no by-products, unlike today’s fission reactors. Another aspect of fusion energy is that the cost of production does not suffer from diseconomies of scale. “It’s a very clean source of power, the cleanest you could possibly wish for. We’re not doing this for us, but for our children and grandchildren,” one of the team, physicist John Jelonnek from the Karlsruhe Institute of Technology, said in a statement. So far, the stellerator isn’t able to generate more energy than it consumes because it’s still just a proof of concept, but the fact that it works is incredibly impressive. This is a 425-tonne machine which took 19 years to construct, requiring 1.1 million construction hours in total. The level of complexity and overall finesse of the device is amazing and all in all, the proof of concept seems to be successful. “Wendelstein 7-X has just started operation, with the aim to show that the earlier weaknesses of this concept have been addressed successfully, and that the intrinsic advantages of the concept persist,” the researchers explained in the study.